I don’t know whether it’s really sweet or creepy, but either way, this girl has got her mate’s back. If I was on a date and my friend was sat behind me in a mask and hoodie, I would probably reflect on why I wasn’t on a date with her instead. 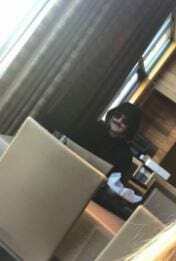 Presleigh Dawsyn didn’t need to worry about faking a phone call if her date was going badly, because her best mate Georgia was sat behind her, disguised as what looks like a member of Anonymous. Georgia was checking up on Dawsyn and texted her saying ‘Why aren’t you eating your food’, and then said ‘look behind you’. Dawsyn tweeted the text and an over-the-shoulder shot of her masked mate, saying ‘when your best friend wants to make sure your first date goes well’. Twitter loved the gesture and the post received over 170k retweets and 390k likes. you're both!! crazy!! in the best!! possible!! most loving!! way!! When you’ve got mates like that, who really needs dates. I don’t think my friends would react as well if I tried this one out. Won’t know till I try.